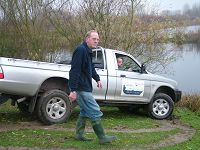 It was reported that on the 4th of December last that Chris Blunt who was driving his 4X4 pick up along the back bank of Smiths Pool lost control in the boggy conditions and he along with his vehicle nearly ended up in the lake. Below is the official report submitted to the Health & Safety Department by Mr J Newland. REPORT BY JOHN NEWLAND LINEARS OFFICIAL PIKE WARDEN & STUDENT PIKE FISHER TO BASIL HOPKINS. On Friday afternoon myself and Head Bailiff, Roy Parsons, were on patrol when Roy received a 999 call from Fishery Officer, Chris Blunt, who sounded in a distressed condition and we could just make out his plea for help which said,” I’m nearly in the lake with my 4X4 - at the back of Smiths Pool”. Roy and myself proceeded to the incident where we found Chris Blunt being comforted by Mr Hopkins, Linear’s Building Consultant and International Piker [Pikey]. On hand was Kemo [Ian Russell of Heathrow Bait Services] who was not offering a service of any kind but extracting the urine. I was not impressed by Kemo’s attitude – as you all know this sort of behaviour is deeply offensive to all of us here at Linear and Roy will not tolerate this sort of thing. Well only a little bit [Kemo of course is a recognised master so some leeway is necessary]. I immediately took command because as you probably all know I have a lot of experience in getting out of the effluent. So with Roy’s 4X4, a long rope and a tree we extracted Chris’s pick up. Len told Roy that Chris should be sent on a 4X4 driving course and could he find somewhere suitable? Roy’s reply was “yes the British Army for three years”. Well, I thought this was a bit harsh but on second thoughts it would make a man of him and he would walk tall when he came home. ANYWAY WE ALL DO STILL LOVE HIM, A LITTLE BIT.